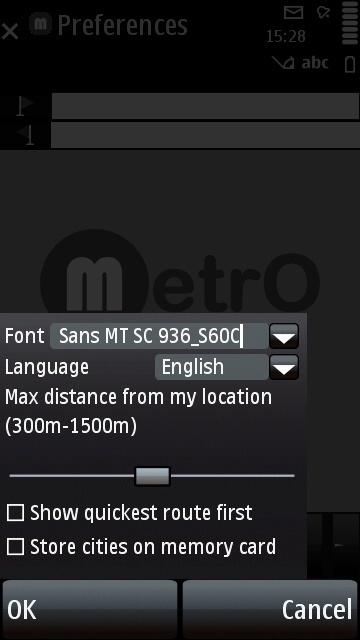 As on other platforms, Métro for the Symbian Qt is free to use. In exchange, we count on your help to make the software better, by notifying us of updates and reporting changes in your transportation network. Alternatively, you may send us a donation. Métro runs on any Symbian with Qt libraries regardless of the system version. An active Internet connection is required to search and download the city files used by the app. Please read the instructions below for installing cities. Before using Métro , you must read our licence agreement. If you don't agree with its terms, you must not download the software and you must delete any copy that may be in your possession. Métro may be available in the future from the Ovi Store. For running the application, Qt libraries is needed. If the message “Component ‘Qt’ missing” is shown in the installation process, download and install Qt. NOTE: If you are downloading this from your mobile phone, use WLAN to avoid excessive data charges. If you are downloading this from your pc, install Qt runtimes and Qt webkit. To install the latest version of Métro download and run the sis file. We know you don't want to bother with reading the user guide but we would like to highlight a few tips for somewhat "hidden" features. Please read these lines to be sure to use the application to the full! On your first use, the screen is empty. Press /Options/Menu/Cities to get a list of all available cities (this step requires an active internet connection). Delete installed cities by pressing . Check for and load updates by pressing . Or press to check for and load updates for all installed cities. The main screen includes two fields to set your departure and destination stops. At any time, one of these fields is "active", as can be seen from its blue circling. The active field is the one "used" when you press the button or when you select a stop on a list. To switch the "active stop", press on the currently active field and move your finger to the other field. When you press , the program searches and displays your route. When you press , the departure and arrival stops are exchanged and the program immediately searches and displays the return route. In cities where geographic data is available, the button will be active. Press it to set your current location as your departure or destination (depending on which one is the "active stop"). Please note that the location acquisition can take some time. In addition, this option is available only if you have activated the "Location services" in the "General" tab of the Symbian "Settings" app. In cities where geographic data is available, you may enter a street address for your start point or destination. Just add an '@' before the full address (with the city name). This option requires an Internet connection. However, your last 20 searched addresses are saved (and listed as soon as you enter the '@' character) and no connection is necessary to use them again. Within the route results, you may tap on any text line to display details on the corresponding route step. Press to erase the screen contents (departure and arrival stop fields and the route results, if any) and restore the day and time to their current values. When you press , it will show the 10 last stops you used in a search. When you press /Options/Menu/Lines, you get a list of "line groups" and routes. The ckeckbox next to each item gives the option to deactivate (or reactivate) "groups" and routes. When deactivated, a "group" or route will not be used for a calculation. Deactivated "groups" are saved when you quit the program (and will be restored on your next use), but not individual deactivated routes. The checkbox next to a route is grayed out if its "group" is deactivated and cannot be checked (you have to reactivate the "group" to change the line status). Line names are grayed out when they are not operating at the currently selected day and time. When you tap on /Options/Menu/POI, a list of POIs ("Places of Interest") for the current city appears. If there are no POIs available for this city, the button is grayed out. But don't hesitate to send us information to enhance our databases. You may access to the app preferences by pressing /Options/Menu/Preferences. You may return to the city list screen by pressing /Options/Menu/Selection Network. 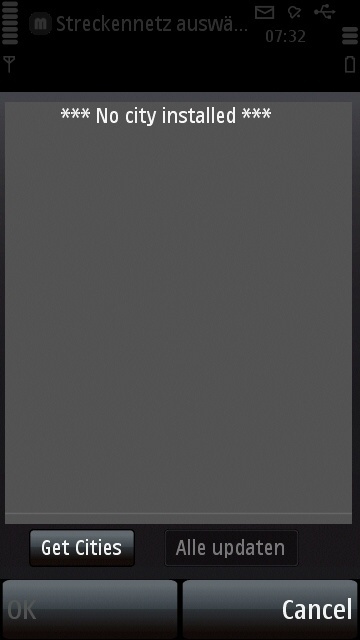 On its first use, the app shows an empty city list, as confirmed by a message. Your next step is to tap on /Options/Menu/Select Network to receive a full list of the cities available (this action requires an active Internet connection). Every time a process may be taking some time to complete, a wait spinwheel is displayed and animated. Your device is never "locked" and will always allow for a phone call to get through, for example. 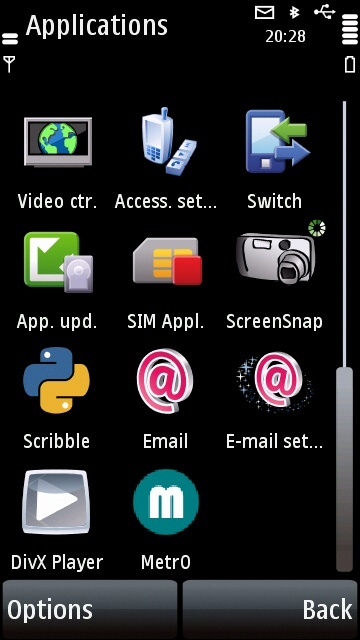 The app taps our servers to get databases on your Symbian phone. This ensures that you have anytime access to all the cities available and that you may always get the latest updates. If you worry about the data exchange, we guarantee that we never transmit nor store any personal data coming from your device. Or that the WiFi connections is activated. 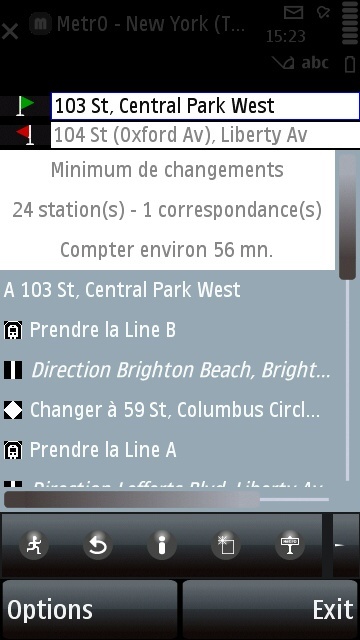 Upon reception from our servers, the list of cities available for Métro is displayed. A "flash" icon indicates that the file is not installed and must be downloaded before use (vs. a local file, which has action buttons, & ). As of the current version, only ASCII files are supported. Other encodings (cyrillic, chinese, japanese...) will be added in the future. In the list, select the city you want to use (you may navigate faster with the index on the right side). To download a city, just press its name in the list. Downloading a city may take some time, especially if you have a slow connection. Yes, once again, an Internet connection is required to download a city. The "wait spinwheel" may thus remain on screen several seconds. However, from this point, no connection is needed anymore for most operations. City files are stored on your device and you can direcly access all the cities you have installed without any conection to our servers. If everything went well with the previous steps, you are now on the app main screen and the window title reminds you of the city you have "opened". You may return to the city list at any time, using /Options/Menu/Select Network, at the top left corner of the screen. There, you will see all the cities you have installed. As explained above, you can get the list of all cities available with the /Options/Menu/Select Network. to remove a city from your device. to search for and, if necessary, install an updated version of the selected city. to search for and install, if necessary, updated versions of all the cities present on your Symbian phone. Special versions of some cities (e.g. Berlin, New York and Paris), labelled "Works", "Travaux" or "Bauarbeiten" include short-term disruptions and are updated very frequently. Their use is recommended only if you don't mind updating them at regular intervals (at least once a week in most cases). To compute a route, you must first provide your starting point and your destination. One option is to simply enter stop names in the fields at the top of the screen (with green and red flags). You don't have to bother with accents or special characters (or even whitespace), the program will recognize the names anyway. To run the calculation, press the "Route" key on the keyboard, when you have entered your destination, or the "compute" button . The "stop list" shows a complete of stops and POIs available in the current city, with POIs in italic. The index on the right side lets you scroll quickly through the list. When you have found what you are looking for, select the stop and it will fill the currently selected field (the one with the blue ring). When you are done with your selection, you can run the calculation with the "compute" button . When you enter stop names with the keyboard, a special list will appear. It contains all the stops that match the characters you enter (ignoring accents, special characters and whitespace). You can scroll the list to select the stop you are looking for. When you tap on one stop name, it fills the currently selected field and the keyboard is hidden. If you have activated the "Location services" option in the Symbian "Settings" app, you can compute a route from or to your current location. Press the "My location" button to set a special stop name ("My Location") in the currently selected field. This function is available (and the button active) only for cities where geographic coordinates are included (36 cities at the time of this writing). 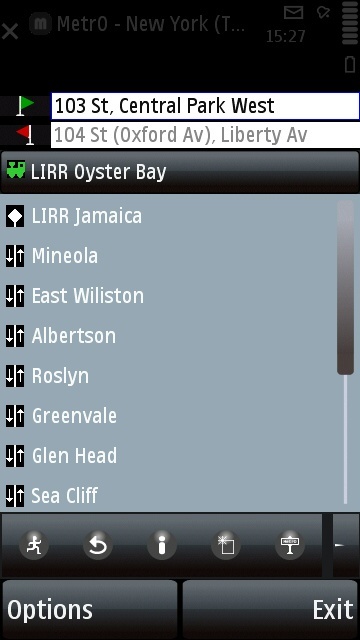 The app also keeps a history of the last 10 stops or POIs used in a route, accessible by tapping twice on the "Stops" button . As in the complete list, tap on a stop name to select it as your start point or destination. When you run a calculation, after a short delay, your route is displayed with all the necessary details. As in all versions of Métro , you get the quickest route and, when appropriate, the route with the minimum number of changes. The route "title" provides some general information, such as the estimated trip time, the number of stops and changes. With cities including geographic coordinates, you have the option to compute a route from or to a street address. To do so, just prefix your entry with an '@' and type the complete address (with the city name). As soon as you enter the '@' character, a list of the last 20 used addresses is displayed and you can just select one of them. The button displays detailed information on the address you have entered, including a map that lets you check that its location has been correctly found. An active Internet connection is required to geolocate addresses and a message will ask you to wait a moment if you have launched a calculation before the information is received. Once an address has been geolocated, it is stored and it is then possible to reuse the last 20 saved addresses without connecting again to the network. When the start point or destination is an address, the program will look for the closest stops within the same range as for the "My Location" feature (which you can set in the Preferences, see below). If no stop is found within this range, the single closest stop within about 5 km will be used. Address geocoding is provided by Google Maps, any error with this feature should be reported directly to Google. For a line, you get a detailed list of all stops you will get through. For a stop, you get a list of nearby POIs and stops (where a change is possible) and all lines going through (see the screenshot). For a POI, you get information about the place (when available) and a list of nearby stops. The "Information" button provides the same kind of information for the currently selected field. Whenever the geographic coordinates are available in our databases, the detailed information also includes a map of the surroundings. This feature requires an active Internet connection. By default, the app searches a route for the current day and time. But in many cities, the public transportation services change depending on the day of the week and the time of the day. If you want to compute a route for a different period, tap on the "day and time" button (on the right of the actions buttons row). In the dialog that appears, select the desired day and time and press "OK". 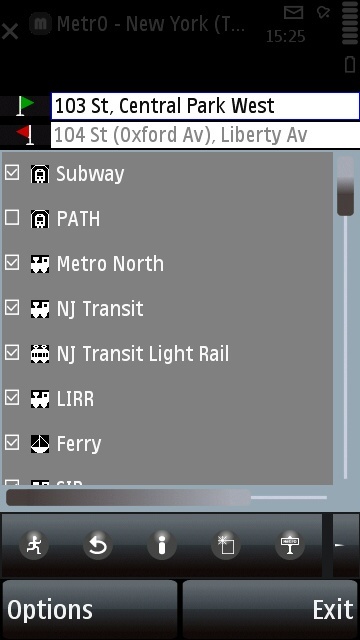 The /Options/Menu/Lines display a list of public transportation systems and lines available in the current database. In almost all the cities, the system and line names are accompanied by an icon representing the type of transportation (subway, railway, bus, tram, trolley, ferry...), painted in its assigned color (if relevant). Lines that are not running at the selected day and time are grayed out in the list (e.g. 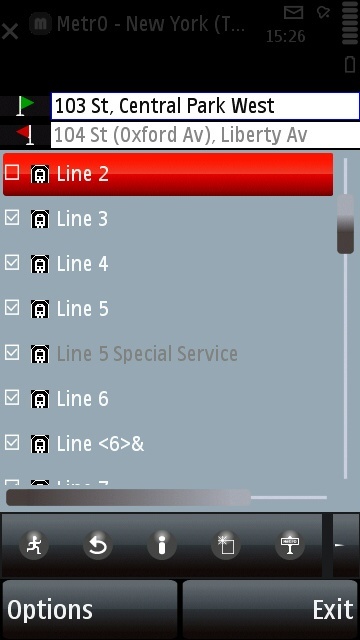 "Line 5 Special Service" in the screenshot, which runs only at peak times, not at 12PM). If you tap on one of the "groups", the list is filtered to show only the individual lines comprised within this group (in the screenshot, the "Subway" group has been selected). Press again on the group name to revert to the full list. 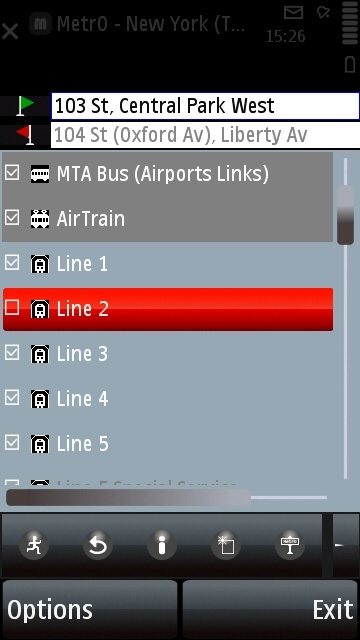 When you tap on a line name, you get a description of the line route, with all its stops. The icon preceding every stop name shows whether the stop is served in one way or both. The checkbox that appears before the group and stop names shows whether the group or stop is "activated". Check or uncheck the box to change the group or line status. When a line is deactivated, it is not used when computing a route. When a group is deactivated, all its lines are deactivated (and therefore not used for a route calculation). When a group is deactivated, the checkbox before every line included in this groupe is in an "undetermined" state and its individual status cannot be changed. On the screenshot, the "PATH" group has been deactivated and all PATH lines are unavailable. The program saves your choice of group activations (not for individual lines) and will restore that choice whenever you run the app. Select if you prefer to get the route with the minimum number of changes first when 2 results are available. When using the location services or street addresses, you can select the maximum distance to search for a stop from your location or from the given address. /Options/Menu/About Métro shows general information about the program and the current city. You should check that information out every time you install a new file. /Options/Menu/Select Network brings you back to the city list. "Return route" exchanges the start point and destination and immediately runs a calculation for your return route. "Reset" clears the screen contents and reset the day and time to their current values. Unicode database is not supported. Reverse display line is not implemented. Rest assured that we will do everything possible to fix these issues as soon as possible (as a matter of fact, they are fixed, in an upcoming release). 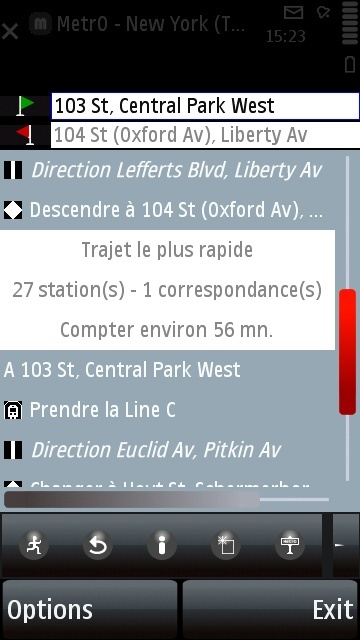 If you don't want to install Métro on your Symbian phone, you may still use i-Métro , our online version. The "classic" i-Métro: feature-complete (including mapping in some cities) but it is not optimized at all for small screens. Just point the Symbian browser to http://imetro.nanika.net. The "mobile" i-Métro: better adapted to small screens but it has less features than the other versions. Just point the Symbian browser to http://i-metro.mobi. Copyright © 1997-2011 Kinevia SARL. All rights reserved.